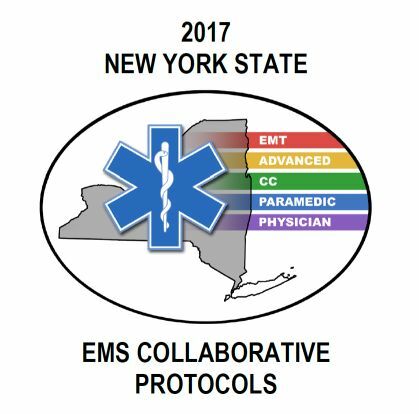 After several years of revisions the 2017 New York State EMS Collaborative Protocols are ready for rollout. I never thought I would see it in my EMS career, but they are almost statewide! The only EMS Regions that have not signed onto the protocols are NYC, Nassau and Suffolk. The advantages to a statewide set of protocols are many. EMTs and Advanced providers will now be able to move from Region to Region and have the same set of protocols. There has also been collaboration in developing the training curriculum. Below is the Collaborative Protocol Educational Resource Document. Existing Critical Care Technicians and Paramedics will need to individually attest to completing the components of the educational rollout. Your attestation will be taken to the Medical Director, Dr. Donald Doynow, for approval. If you are already credentialed in the AAREMS Region you will not have to take a credentialing exam. New providers to the region will need to take an open book credentialing exam. There will be a classroom educational component for both ALS and BLS providers. ALS will be in the form of self-study and an eight hour classroom day, and BLS will be in the form of a four hour classroom day. All classes will be from March 14th to March 28th. They will be offered days, evening and weekends. Sign up under Events on EMS eSchedule. ALS classroom will include- new ALS and BLS bags, King Airways, T-pod pelvic girdle, Tactical kit, CS Review, passive oxygenation, medications (K Centra, Alteplase, Ketamine, Decadron and Cardizem for CC), and additional review of "new skills" such as double sequential defibrillation. This day will be scheduled for two four hour blocks with an hour lunch in between. Have your self-study attestation sheet complete to be turned in at class. Self- Study attestation sheets should be turned in no later than March 30th- as Dr. Doynow will be signing all forms on March 30th. BLS classroom will include- new ALS and BLS bags, T-pod pelvic girdle, Patella reduction, End of Life, Massive Bleeding, Eye Irrigation and the Tactical kit. 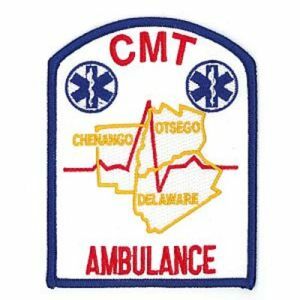 During the last week in March CMT, will be updating our rig and supply room inventories for the new equipment and medications. The dates for roll over are March 29th and 30th with an additional day of March 31st if needed. It takes lots of manpower and coordination to touch all 18 rigs and supply rooms in two days so if you are scheduled to work please be patient and helpful. CMT's target date for implementation will be March 31, 2017. If you have not completed the educational components of the protocol update you will be taken off line until complete. We cannot hold back the entire company moving to the new protocols for one or two people who do not meet the rollout requirements. The "new" smart phone app should be available for both Apple and Android phones March 1, 2017. BE CAREFUL- do not download the new app until the end of March! An exam will be created to be taken "open book" with the primary intent of assuring the providers are proficient with navigating the application and efficiently finding information. The simulation videos are intended to demonstrate patient care scenarios in the context of the NYS collaborative protocols. Like the rest of medicine, there are different ways of practicing EMS and we encourage providers to watch the videos with a critical eye and think about how they would debrief the scenarios if they were the instructor/supervisor. Separate links for each module are listed so that you can chose which you would like to share with the providers in your region based on your needs. Special thanks to Laerdal for their assistance with these videos. The podcasts are not "all-encompassing", but focus on particular points of interest. Providers often have questions about why certain things came out the way they did. In addition, there are some things that were discussed while we were writing the protocols that would be worth conveying to make sure the effect of the protocols results in the optimum patient care. The podcasts span two episodes and cover the topics below.